Have you read the Hundred Oaks series yet? If not, you really should. It's one of the best contemporary YA series out there right now. Each book features a strong female character who is typically passionate about a sport and also has some fabulous romance. Miranda Kenneally is the author of CATCHING JORDAN, STEALING PARKER, THINGS I CAN'T FORGET, and RACING SAVANNAH. Her fifth book, most likely to be titled BREATHE, ANNIE, BREATHE, is coming out in July 2014. She enjoys reading and writing young adult literature, and loves Star Trek, music, sports, Mexican food, Twitter, coffee, and her husband. Please welcome Miranda to Alison Can Read! 1. Tell us a little about Racing Savannah and the entire Hundred Oaks series. 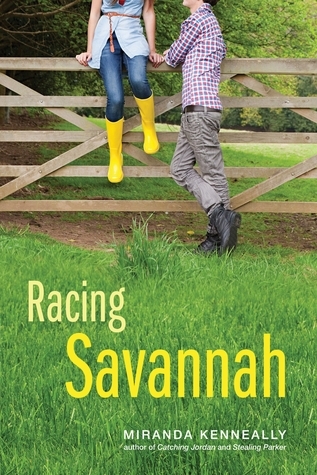 Racing Savannah is about a 17-year-old girl who moves from a trailer in West Virginia to live on a fancy horse farm in Tennessee where her father just got a job. All she wants is to become an exercise rider so she won't end up working in a motel after high school, but then the owner's son gives her the opportunity to become a horse jockey and it makes her rethink her whole life. 2. I love how the Hundred Oaks books are a set of loosely connected companion novels. Did you have in mind from the very beginning which characters you planned to have star in their own books and how the series would all connect? Honestly, it sort of just happened. I had already written Catching Jordan, and when I started writing Stealing Parker, characters from Catching Jordan just showed up. I had planned to write stories set in various Tennessee towns, but I'm glad that everything revolves around Hundred Oaks High. 3. Between Jordan, Parker, Kate, and Savannah, which character do you relate to the most and who was the hardest to write? Of all the characters I've written, I'm most like Savannah. Not that I'm interested in horses, but that I stand up for myself and go after my dreams. I work really hard to accomplish my goals, and I don't let anyone tell me I can't do something if I want to do it. In Racing Savannah, Savannah learns that even though she's poor and nobody in her family has ever been to college, she has the right and the strength to apply to any school she wants. I hope that in reading Racing Savannah, all girls and women will learn that they have the right to do anything they want and have the power to go after it. The hardest character to write was Kate! I really felt for her, but I also didn't like her much as a person. I knew where I wanted her to end up at the end of the book, but writing her earlier moments was tough in that she was so judgmental and set in her ways. 4. What are some of your favorite YA books? Either new or old. I could go on and on... I really love JELLICOE ROAD by Melina Marchetta. I love anything by Sarah Dessen. THE SKY IS EVERYWHERE is a particular favorite. I adored JUST ONE DAY and JUST ONE YEAR by Gayle Forman. I love DASH AND LILY'S BOOK OF DARES. 5. What is one piece of writing advice that you find really useful beyond the typical read a lot and write a lot? Thank you so much for the interview, Miranda! Great interview! Haven't read this one yet but it's waiting for me. I've enjoyed the series and like that they're all companions with former characters showing up. It makes it almost soap-opera-y. In a good way! Awesome interview! This is another book that I pre-ordered. I'm excited to see what this Savannah has to offer. Great interview! I read Crossing Jordan a while back, and really enjoyed it. I need to get caught up with the rest of these books!